“Surf Ride” Savoy Featuring Art Pepper and an all-star west coast jazz band. (1954) Another example of incongruous cover art. Well, I don’t know if the music doesn’t fit the cover. I haven’t heard the record. Maybe those guys where trying to come up with something different. 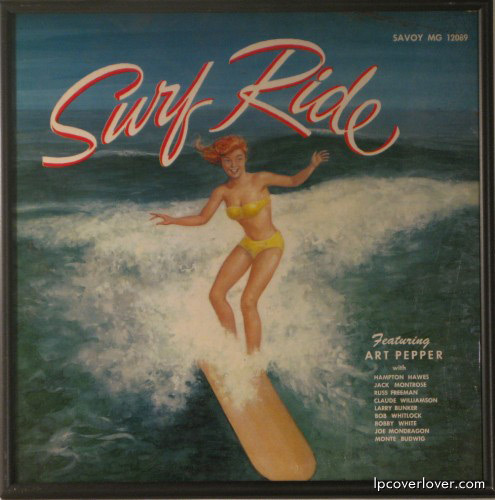 “Surf Jazz?” Why not! It’s got her smilin’. No matter the music, I love the cover. Hey, Art Pepper graduated from the same high school as me! San Pedro is a beach town, so maybe that’s where the surf bit came in. You know Art Pepper has been in an out on heroin. I figure once he was so stoned he wrote a song about a girl surfing on a lollipop stick. I mean “in anD out oF heroin”. I am clean, I swear.